A US M242 25 mm Bushmaster autocannon mounted on an M2 Bradley fighting vehicle. Two ZU-23-2s, a twin barrel 23x152 mm anti-aircraft autocannon still in service with some former members of the Warsaw Pact from the 1960s. An autocannon or automatic cannon is a large, fully automatic, rapid-fire projectile weapon that fires armour-piercing or explosive shells, as opposed to the bullet fired by a machine gun. Autocannons often have a larger calibre than a machine gun (e.g., 20 mm or greater), but are usually smaller than a field gun or other artillery. When used on its own, the word "autocannon" indicates a single-barrel weapon. When multiple rotating barrels are involved, the word "rotary" is added, and such a weapon is referred to as a "rotary autocannon." Modern autocannons are typically not single soldier-portable or stand-alone units, rather they are usually vehicle-mounted, aircraft-mounted, or boat-mounted, or even remote-operated as in some naval applications. As such, ammunition is typically fed from a belt to reduce reloading or for a faster rate of fire, but a magazine remains an option. They can use a variety of ammunition: common shells include high-explosive dual-purpose types (HEDP), any variety of armour-piercing (AP) types, such as composite rigid (APCR) or discarding sabot types (APDS). Although capable of generating a high rate of fire, autocannons overheat if used for sustained fire, and are limited by the amount of ammunition that can be carried by the weapons systems mounting them. Both the US 25 mm Bushmaster and the British 30 mm Rarden have relatively slow rates of fire so as not to use ammunition too quickly. The rate of fire of a modern autocannon ranges from 90 rounds per minute (in the case of the British Rarden), to 2,500 rounds per minute with the GIAT 30. Systems with multiple barrels can have rates of fire of over 10,000 rounds per minute (the Russian GSh-6-23 for example). Such extremely high rates of fire are effectively employed by aircraft in air-to-air combat and close air support attacks on ground targets, where the target dwell time is short and weapons are typically operated in brief bursts. The first modern autocannon was the British QF 1 pounder, also known as the "pom-pom". This was essentially an upscaled version of the Maxim gun, which was the very first successful fully automatic machine gun, requiring no outside stimulus in its firing cycle other than holding the trigger. The pom-pom fired 1-pound gunpowder-filled explosive shells at a rate of over 200 rounds a minute: much faster than conventional artillery while possessing a much longer range and more firepower than the infantry rifle. During the First World War, autocannons were mostly used in the trenches as an anti-aircraft gun. The British used pom-pom guns as part of their air defences to counter the German Zeppelin airships that made regular bombing raids on London, but they were of little value, as their shells neither ignited the hydrogen of the Zeppelins, nor caused sufficient loss of gas (and hence lift) to bring them down. Attempts to use them in aircraft failed as the weight severely limited both speed and altitude, thus making successful interception impossible. The more effective QF 2 pounder naval gun would be developed during the war to serve as an anti-aircraft and close range defensive weapon for naval vessels. Autocannons would serve in a much greater capacity during the Second World War. During the inter-war years, aircraft underwent an evolution and the all-metal monoplane, pioneered as far back as the end of 1915, almost replaced wood and fabric biplanes. The subsequent increase in speed and durability greatly reduced the window of opportunity for defence. Heavier anti-aircraft cannon had difficulty tracking fast-moving aircraft and were unable to accurately judge altitude or distance, while machine guns possessed insufficient range and firepower to bring down aircraft consistently. Weapons such as the Oerlikon 20 mm and the Bofors 40 mm would see widespread use by both sides during the second World War; not only in an anti-aircraft role, but as a weapon for use against ground targets as well. Continued ineffectiveness against aircraft despite the large numbers installed during the second World War, led, in the West, to the removal of almost all shipboard anti-aircraft weapons in the early post-war period. This was only reversed with the introduction of computer-controlled systems. The German Panzer II light tank, which was one of the most numerous in German service during the invasion of Poland and the campaign in France, used a 20 mm autocannon as its main armament. Although ineffective against tank armour even during the early years of the war, the cannon was effective against light-skinned vehicles as well as infantry and was also used by armoured cars. Larger examples, such as the 40 mm Vickers S, were mounted in ground attack aircraft to serve as an anti-tank weapon, a role to which they were suited as tank armour is often lightest on top. Polish 20 mm 38 Fk auto cannon was expensive to produce, but an exception. Unlike Oerlikon, it was effective against all the tanks fielded in 1939, largely because it was built as an upgrade to the Oerlikon, Hispano—Suiza, and Madsen. It, with a great difficulty, proved capable of knocking out even early Panzers 3 and 4. Only 55 were produced by the time of the Polish Defensive War. In aircraft, several factors brought about the replacement of rifle-calibre machine guns by autocannons. Early autocannons were heavy and had a slow rate of fire, severely limiting the ability of the firer to use them effectively. Along with the speed, the size of aircraft grew substantially, particularly in the 1930s, so that the weight was less of an issue while the rate of fire, and reliability were greatly improved. During the second World War, the use of armour plate to protect the pilot and other vulnerable areas caused machine gun rounds to ricochet off. Similarly self sealing fuel tanks were able to close small holes, protecting against machine gun rounds. While a lot of machine gun rounds and a fair amount of luck were needed to cause critical damage, a single cannon shell could instantly sever essential structural elements, penetrate armour or open up a fuel tank beyond the capacity of self-sealing compounds, even from fairly long range. By the end of the war, virtually all fighter aircraft mounted cannon of some sort, the only exception being the United States Army Air Forces favouring the "light-barrel" Browning AN/M2 .50 calibre heavy machine gun. The German Luftwaffe deployed small numbers of the experimental Bordkanone series of heavy aircraft cannon in 37, 50 and 75 mm calibres, mounted in gun pods under the fuselage or wings. The 37 mm BK 3,7 cannon, based on the German Army's 3.7 cm FlaK 43 anti-aircraft autocannon was mounted in pairs in underwing gun pods on a small number of specialized Stuka Panzerknacker (tank buster) aircraft. The BK 5 cm cannon, based on the 5 cm KwK 39 cannon of the Panzer III, was installed in Ju 88P bomber destroyers, which also used other Bordkanone models, and in the Messerschmitt 410 Hornisse (Hornet) bomber destroyer. 300 examples of the BK 5 cannon were built, more than all other versions. The PaK 40 semi-automatic 7.5 cm calibre anti-tank gun was the basis for the BK 7,5 in the Ju 88P-1 heavy fighter and Henschel Hs 129B-3 twin engined ground attack aircraft. The German Mauser MK 213 was developed at the end of the second World War and is regarded as the archetypal modern revolver cannon. With multiple chambers and a single barrel, autocannons using the revolver principle can combine a very high rate of fire and high acceleration to its maximum firing rate with low weight, at cost of a reduced sustained rate of fire compared to rotary cannon. They are therefore used mainly in aircraft for AA purposes, in which a target is visible for a short period of time. The development of guided missiles was thought to render cannons unnecessary and a full generation of western fighter aircraft was built without them. In contrast, all Eastern Bloc aircraft kept their guns. During the Vietnam War, however, the U.S. Air Force realized that cannons were useful for firing warning shots and for attacking targets that did not warrant the expenditure of a (much costlier) missile, and, more importantly, as an additional weapon if the aircraft had expended all its missiles or enemy aircraft were inside of the missiles' minimum acquisition range in a high-G close range engagement. This was particularly important with the lower reliability of early air-to-air missile technology, such as that employed during the Vietnam War. As a consequence, fighters at the time had cannons added back in external "gun pods", and virtually all fighter aircraft retain autocannons in integral internal mounts to this day. After the Second World War, autocannons continued to serve as a versatile weapon in land, sea, and air applications and continue to do so to this day. Examples of modern autocannons include the 25 mm M242 Bushmaster mounted on the M2/M3 Bradley, updated versions of the Bofors 40 mm gun, and the Mauser BK-27. The 20 mm M61A1 is an example of an electrically powered rotary autocannon. 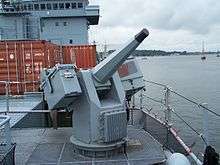 Another role that has come into association with autocannons is that of close-in weapon systems on naval vessels, which are used to destroy anti-ship missiles and low flying aircraft. 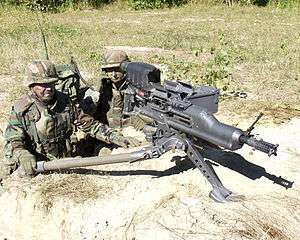 Another weapon that is similar to the autocannon is the automatic grenade launcher. This is usually mounted on a tripod or on a vehicle and is capable of firing explosive shells at a high rate of fire. The main item of distinction is that they fire very low velocity ammunition. Larger forms of artillery have been fitted with autoloaders, which are different. ↑ The GSh-6-30K, a six-barreled Russian rotary autocannon, has a ROF of 6,000 rounds per minute. Williams, p. 241. Department of the Army. Ballistic Data Performance of Ammunition, TM 9-1907. Washington, D.C.: Government Printing Office, 1948. Williams, Anthony G. Rapid Fire. Shrewsbury: Airlife Publishing Ltd., 2000. ISBN 1-84037-435-7. Wikimedia Commons has media related to Automatic cannons.